This brings back memories from barely remembered teen years, Carin. Sitting in my boyfriend’s wreck of a car, ordering burger, fries and milkshakes from the speaker beside the parking spot outside the diner. Our food coming a la Sherry! Love it. Just noticed this place in a little plaza recently and so I had to try it. My test for a diner is how well they manage an order of black tea and white toast. Eventually moving on to peppermint and rye. I don’t actually remember waitresses on roller skates, maybe because we lived in the country and rarely went to diners or restaurants at all (in other words, not because I’m too young!) but I do remember at the A and W when you’d order at an outdoor speaker and they’d come out with your order, dressed in orange snowsuits! 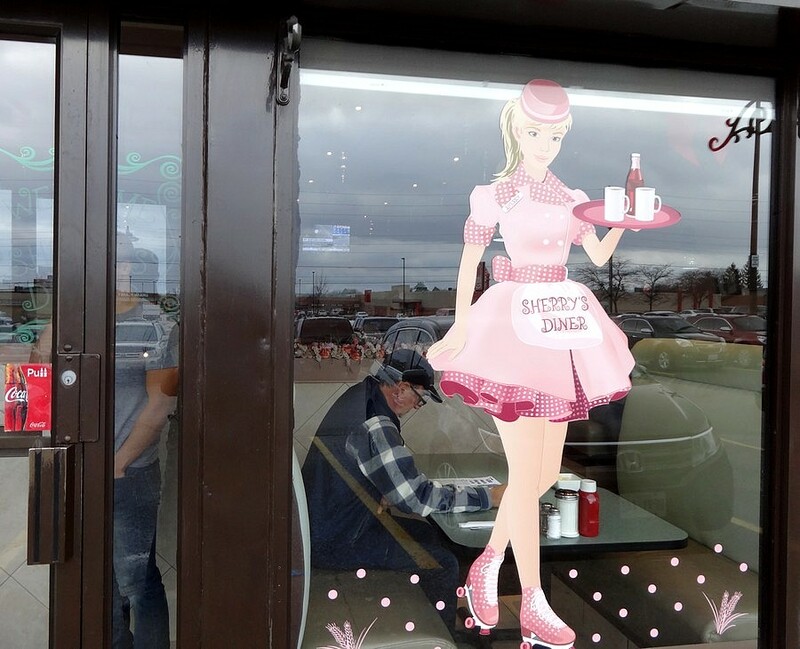 I love the contrast in this photo between the svelte pink clad waitress and the plaid shirted bespectacled customer.